I have to admit that the Malazan series is still on my waiting list. I don't know any of the characters, I have no idea even of what it is all about, but Thrinidir gave me Blood Follows to read nonetheless, saying I needn't know anything about previous Erikson's works to enjoy it. Since it is 'only' a novella and therefore not taking much time to read, I gave it a try. The first thing I've noticed was that the plot flows smoothly throughout the book. Emancipor Reese - married to a woman who gives off an impression that Xanthippe was her kind grandmother, having two kids who are probably not of his own seed and on top of that being followed by a severe case of bad luck - is a character you can't help but sympathise with, even though you never really get attached to him. With his employers getting constantly killed – many of those in odd ways, he can't help but to fruitlessly search for a new job over and over again. This time around, the gods may be finally smiling upon him, since he managed to apply for a job and get it, all in the same evening, and on top of that, he does it while being dead drunk. Sgt.Guld is another POV character, conducting his duty as a kind of detective, trying to solve the mysterious murders haunting the city of Lamentable Moll. Erikson, however, avoids the traditional trope of a detective and rather depicts Guld as a cross–over between a guard, an examiner and a simply curious subject. Erikson's style clearly shows competence, skill and experience, not to mention a rich vocabulary (well, to be perfectly honest, it almost feels like Erikson is showing it off a bit in the beginning, using as many unusual words as possible, and as a non-native speaker, I had some problems with that – but it is a small gripe that can be easily ignored by reading the meaning of the words out of the context). As I've already mentioned before, the world of Malazan is not only unknown, but also a riddle to me – as well as to most of you who are familiar with it (or so I've heard), therefore I felt a bit lost at particular moments, with all the secondary characters parading about. With the plot tugging at you to keep reading, the unfamiliarity with the universe, however, represents just a minor distraction. But regaring the pacing and the plot not everything is perfect, as I found the quick uncoiling of the story at the end quite dissapointing, since the beginning and the middle part seemed to offer more. I guess I'll have to read the main series to discover the potential hidden behind this novel. To sum it up: for a reader, who has never read any of the Malazan books, many questions regarding not the story itself, but the characters and wider setting, stay undisclosed. A few pieces of the puzzle fall together in the last few pages, but the picture that it offers is not entirely satisfying. The novella gives an overall impression of a mix of horror, fantasy and detective fiction, an easy read but interesting nonetheless. The plot includes some bizzare, extraordinary (but nonetheless compelling) characters and a lot of subtle sparks of humour. 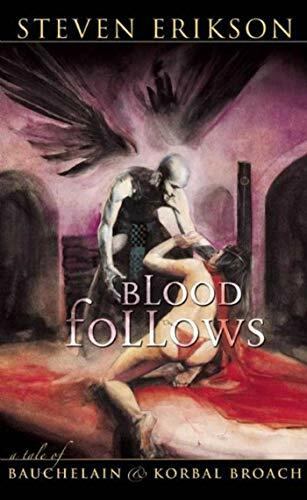 The reading experience is probably different for those who've read the series (and thus know some of the characters in Blood Follows at least briefly), but this novella makes a worthy reading either way.